This is my front doormat. It's cast iron, and we bought it in Ruidoso, N.M., when we were on a road trip. I miss road trips, a lot. Added note: my porch isn't yellow; I took this at sunset, and enhanced the colors. I thought it was a lucky shot. The colors in this photo are surprising! Especially enlarged. Very nice. I love all the lines, shadows and color. You have a yellow porch? Cool! We are big lovers of road trips too. And my dh grew up in NM...just random trivia there. Love cast iron and I love your macro!! I love the graphic quality to this one! Good job! 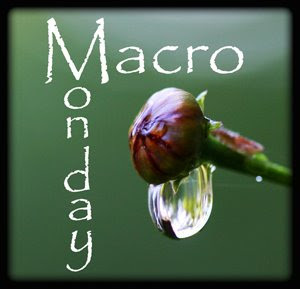 Nice macro shot you got there! 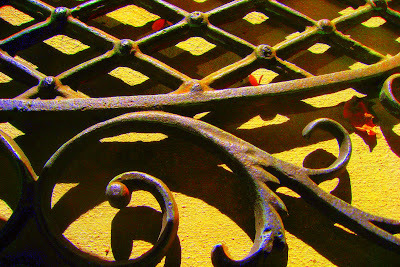 I would never have guessed this was a door mat; it looks like an iron filigree on an old hacienda. Beautiful with the low sun angle. I see in your profile you work at Barnes and Noble --- for the books. :-) I'm thinking of doing the same thing. I really should get paid for single-handedly boosting their sales!